While working for Nature's Sunshine in the 1980s, I worked on developing Ed Millet's ABC+D concept with the goal of creating a way of helping people get effective results with herbs and natural remedies, while complying with the laws prohibiting diagnosing and prescribing. 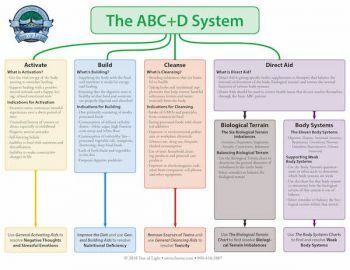 Now, 30 years later, I'm releasing our new updated 5th edition ABC+D Body System Charts, which overview the entire system. These 13 beautiful, full-color charts, printed on heavy cardstock and spiral bound, provide an overview of the ABC+D System, the six tissue state model of biological terrain and 11 charts featuring the body systems. Each chart contains indications that point to the various imbalances that can occur within each body system. There are iridology signs, tongue and pulse information, emotional indications and specific signs and symptoms associated with each imbalance. These point to a particular class of remedies based on energetics, not diseases, such as "Cooling and Soothing Digestive Aids" or "Warming or Stimulating Digestive Aids." There is also a complete list of single herbs, nutritional supplements and, in many cases essential oils and lifestyle changes, found for each category of remedies. Because the charts list diseases among the indications, we can't provide specific brand name formulas on the charts. This system is also the basis for the Sunshine Product Training that is part of this year's member program and the charts are the perfect companion for that course. You can preview some of the charts in the window below. Cost for the charts is $36.